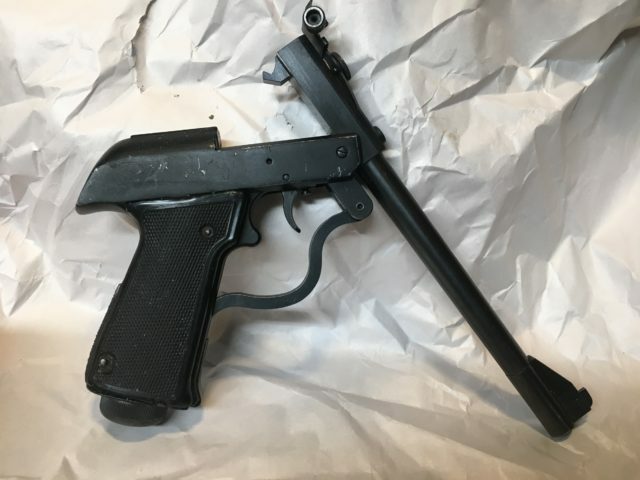 I was reading through one of the many airgun forums I drop into sporadically when someone mentioned that Apex Gun Parts had a few more Polish military air pistols back in stock. I didn’t know that there was a Polish military air pistol, but immediately clicked over to Apex’s site to see what they had. 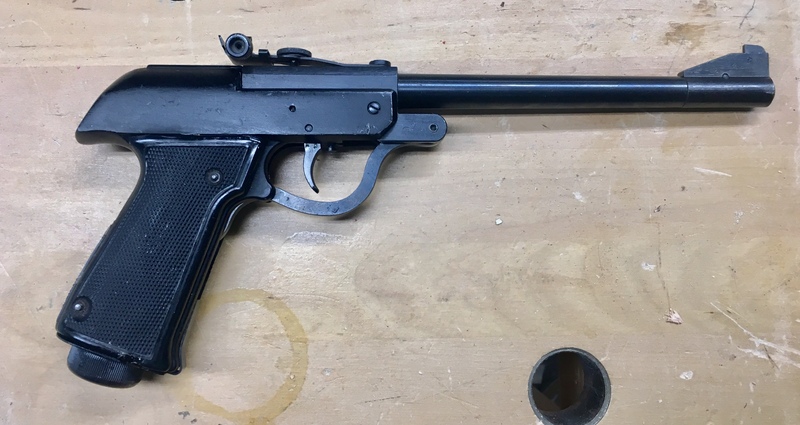 It was a reasonably priced (around $100) pistol with a curious resemblance to the Walther LP-53, a classic German air pistol of the 1960s and 70s. 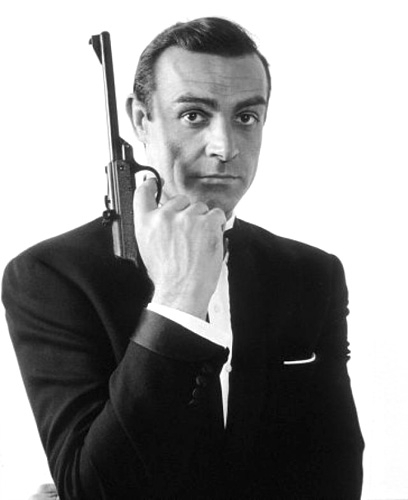 That’s an LP-53 that Connery is holding, and the story of why he’s holding an air pistol, and not the Walther PPK described in the Fleming novels, is an amusing one. It seems someone forgot to arrange for the pistol needed for the photo shoot, and someone on the crew said no problem, I’ve got a Walther, ran home, and came back with his Walther LP-53. This image made it into the poster for From Russia With Love. The LP-53 was an interesting and popular pistol, available in a basic model and also in a more refined target model, with better sights. 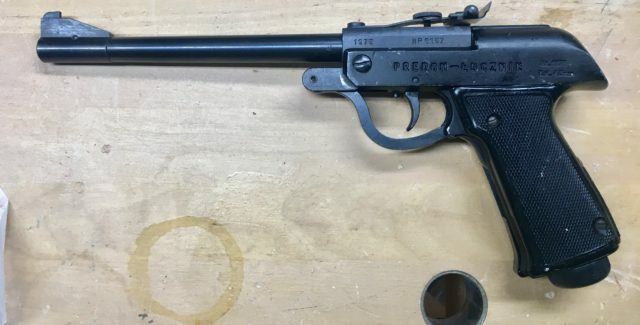 It was popular enough that the Poles took notice, and made their own clone at the government owned Predom Lucznik firearms plant, primarily for use in military training. (There are actually several different civilian and military versions with different model numbers- I’ve seen some marked Wz. 70). 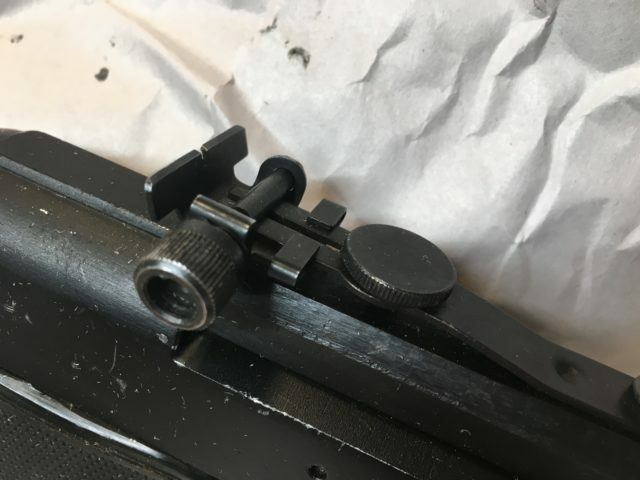 The sights are a bit crude in manufacture, as it the entire gun, when compared to the Walther, but fully adjustable and easy to use. 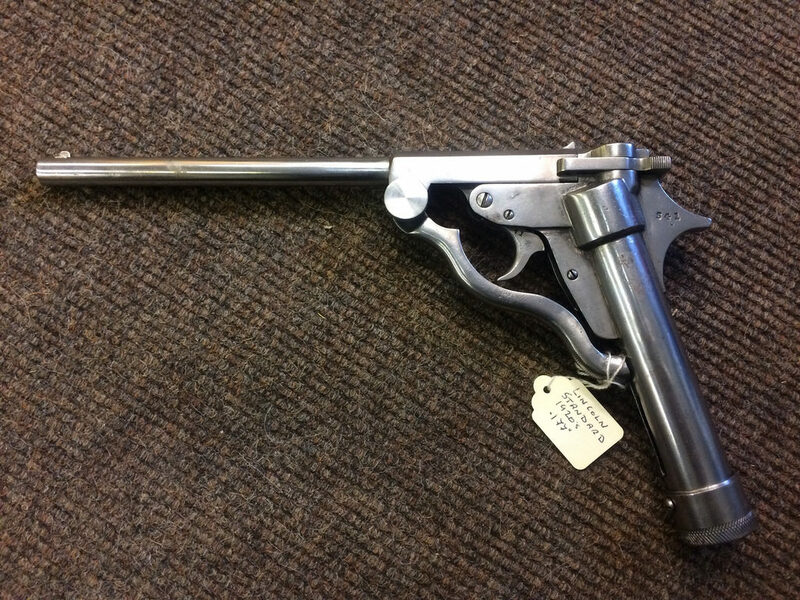 As with the Walther, it’s a spring pistol gun with a novel design- the spring, piston, and cylinder are contained entirely within the grip. There’s a threaded cap at the base of the grip that allows for easy disassembly and rebuilding. A few test shots with the gun suggested that the piston seal was worn out or at least dried out. The gun is supposed to chronoograph at around 380fps with 7gr pellets, but the long delay between trigger pull and the sound of the pellet hitting the trap indicated the gun wasn’t putting out anything near that velocity. Rather than disassembling the gun- it would have been a bit pointless as I don’t have a replacement seal- I decided to try adding a fair amount of silicone oil to the chamber. Modern synthetic piston guns shouldn’t be lubricated as all between rebuilds, but leather sealed guns needed to have the seals kept very wet, with regular reapplication of oil to replace what gets shot out. 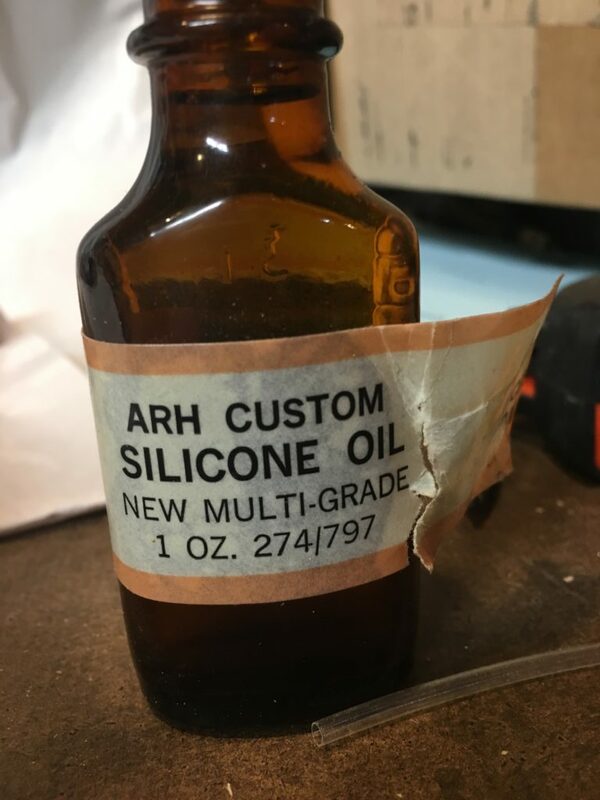 Luckily I had a bottle of 1970s vintage silicone oil on hand. Using an improvised pipette I dropped perhaps .2-..3 mililiter directly into the chamber, worked the cocking lever a few time, and then left it to sit for a few minutes so that the oil would be absorbed by the leather piston seal. The improvement was immediate and obvious, with trigger pulls being immediately followed by a satisfying thwack! of pellet hitting metal. About that trigger: It’s probably the worst airgun trigger I’ve ever encountered. There’s a sear adjustment screw but I’m cautious about turning it too far, based on experience with other airguns. ( I once spent several hours replacing the trigger adjustment screw in my Alfa Proj match pistol after I unscrewed it just a bit too far.) Even with it backed off to minimal safe sear engagement, it’s still a scratchy, unpredictable, release. 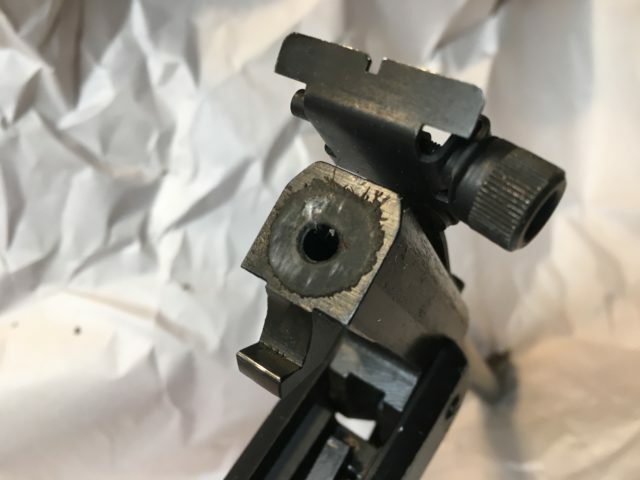 Shooting behavior is rough, too; the unusual vertically recoiling piston means that there’s a lot of up and down movement before the pellet leaves the barrel. This is one pistol that requires a strong grip to shoot accurately. 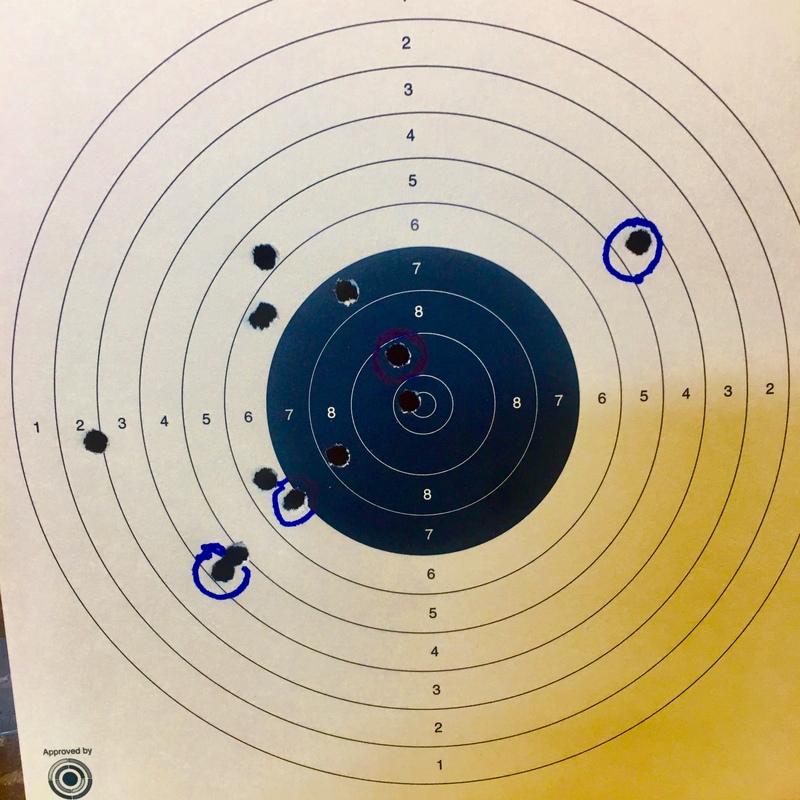 It’s hard to see, but one of my shots was in the 9 ring, just above the shot I made with my FWB 1000. 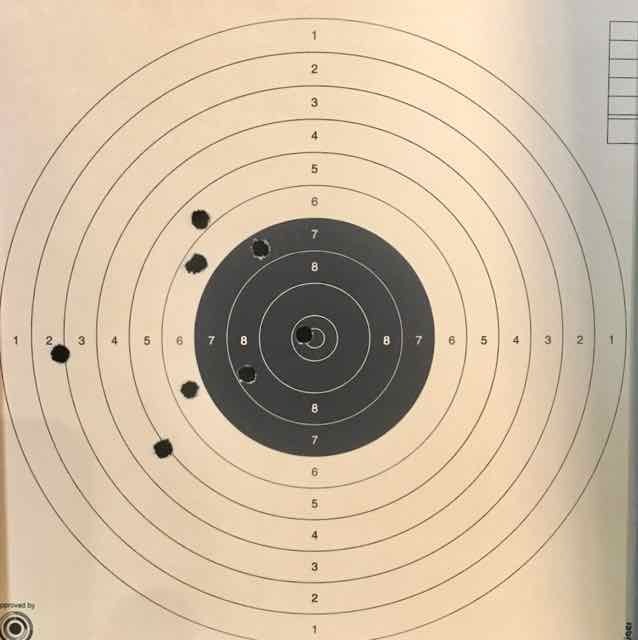 Interestingly, I didn’t shoot it that much better two handed. I’m going to keep practicing and see if I can find a way to get better groups. I may also try shooting it from some sort of rest to see what it’s capable of. This cocking aid consisted of a trimmed-down wooden ball with a recess cut in to clear the sight, and a rod that was inserted into the barrel. 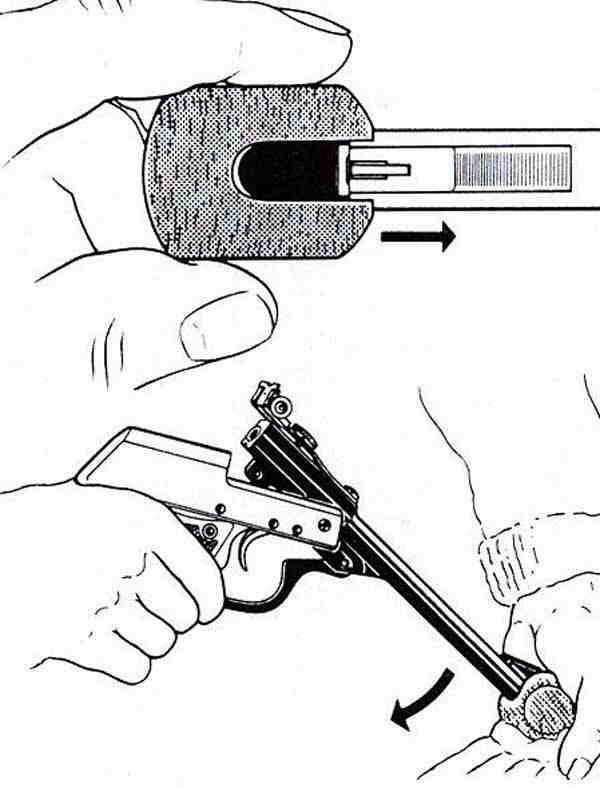 The last inch and a half of barrel were counterbored to the rod wouldn’t damage the rifling, and this feature is complied on the Polish pistol too, though I haven’t yet seen any evidence of a cocking aid being supplied by Lucznik. I’ll probably make something similar this winter. It’s crude, difficult to shoot, and not terribly accurate. I like it. This was written by mje. Posted on Tuesday, November 14, 2017, at 8:02 pm. Filed under General. Bookmark the permalink. Follow comments here with the RSS feed. Both comments and trackbacks are currently closed.